One of the most dynamically developing markets today is that of the Apps let them be for profit or not-for-profit solutions to numerous problems (match-making platforms for bringing together the demand and supply sides, tourism-related apps, fitness and wellness oriented ones, ones featured with the idea of shared economy, etc.). There are many good apps out there, but even the most useful ones fall short in reaching out a high number of users if they are not presented elegantly (e.g. EU-water project toolkit). Believing in the efficiency of an App does not mean believing that any efficiency has yet been achieved. Online marketising for diffusion is of key importance. 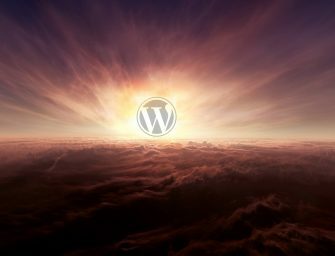 WordPress is firmly keeping abreast with today’s developments and more and more themes are dedicated to showcasing such problem-solving and value-creating Apps (e.g. Amovens, Glovo, Chefly, etc.). Here are the latest and best functioning ones having the potential to trigger fervent demand for valuable Apps. Do you have an App offering cutting-edge services for all? Stop and look at this fresh and still hot WordPress Theme. 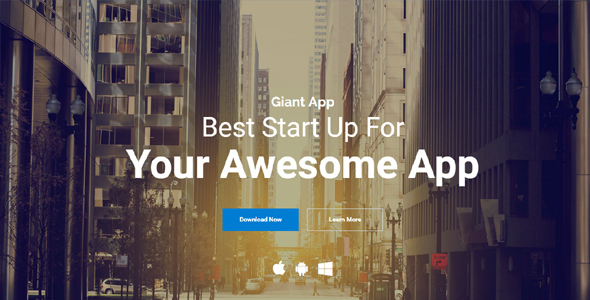 Giant App is the newest WP theme developed by plexdesigns team, which is an ideal choice to introduce your App. Giant App is an easy to use and customized WP theme which uses Unyson Powerful Builder. It was born to create app landing pages, corporate multipurpose landing pages or even business websites with powerful page builder. This minimalist, but fully responsive WordPress theme makes your App as concrete as possible. 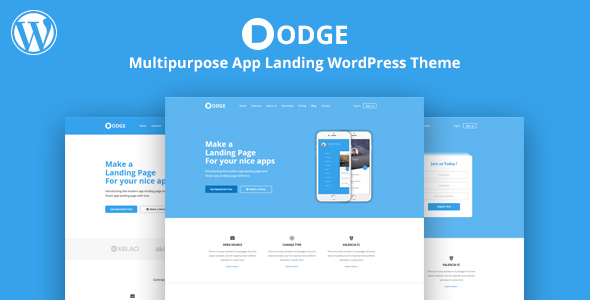 DODGE gives you the comfort of building a clean and awareness raising showcase for your App. An impressive design is equipped with good functionalities via at least 6 Home Variations, 2 Header Variations, 2 Footer Variations, Visual Composer, Custom Visual Composer Addons, Contact Form 7, and the integrated MailChimp. Of course, DODGE is translation ready and WPML compatible. 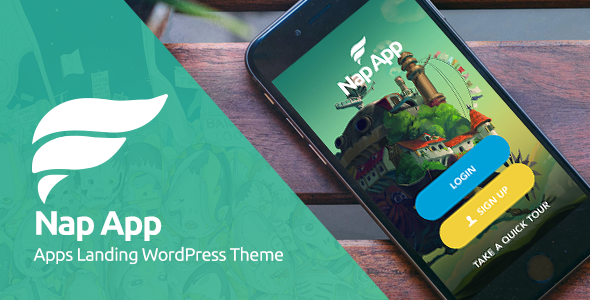 Installing and using NapApp is like lifting up a napkin: easy. By using its modern and fully responsive style, your App will garner increasing attention from the side of clients. The flexibility and the inbuilt functionalities (e.g. Visual Composer, Powerful Theme Options, Based on Bootstrap 3.x, integrated AOS Animation, Unlimited Color & Skin, included Child Theme, Smooth Scroll, WPML readiness etc.) guarantee the success of the App to be widely introduced and diffused. 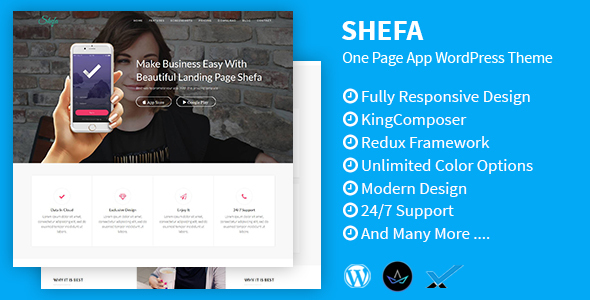 SHEFA is a Stylish, Hybrid, Easy-to-use, Fast and therefore Attractive WordPress theme for creating an App landing page. Clean design, Cross Browser Compatibility, KingComposer, Unlimited Theme Color, just to name a few basic characteristics. 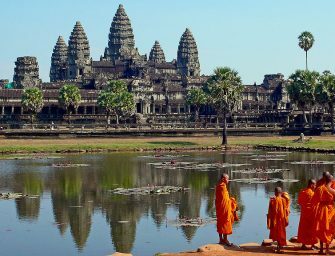 By using this theme, the only two words arising in your head are meaningful simplicity. And this is SHEFA, ‘what else?’. Commercialise your app or raise awareness over your not-for-profit services by installing Appestia is nothing but a smart choice. 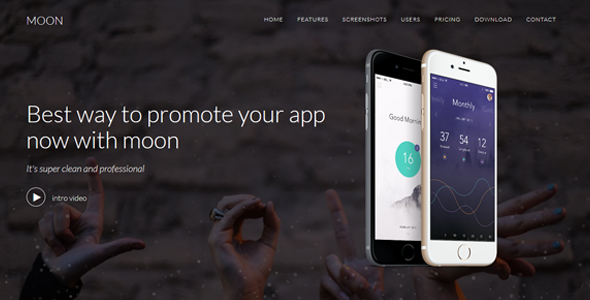 The fully responsive app landing theme has multi color layouts with parallaxt effect. 3 seperate sections are available for app’s features showup. Before you ask, iphone and android mockups are included for the convenience for your future clients. Depending on the complexity of your App developed, Appestia gives you 17+ sections to display any information in various forms you need (even video presentations). PSD and MailChimp are organic parts of this theme. In case of a for-profit App, an eloquently styled pricing table is provided for your purposes. 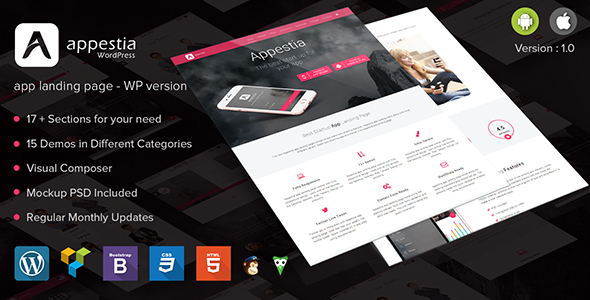 Appo is a retina display ready App landing WordPress Theme built with HTML5 & CSS3. 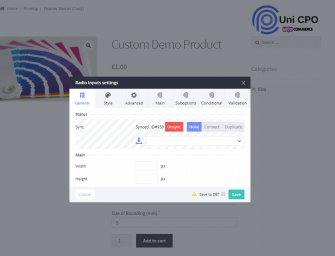 Among other things, Visual Composer, Revolution Slider, Advanced Theme Options Panel, Easy Installation and Demo Data, Font Awasome, Working Contact Form, Parallax Background etc. are making this theme an appealing one. 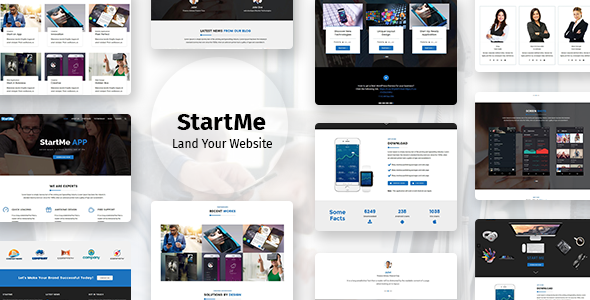 StartMe is not only for mobile apps, but also for products, software, hosting, businesses, startups, product/service developing companies with a special focus on beautiful showcasing. What will get you to pay attention to StartMe is the brilliant combination of different features. For example, more than 30 different header layout combinations, 4 menu layouts, 4 body layouts & custom footer layouts, 12+ landing page variations are available. Quick navigation on both tablets and phones eases your work with the mobile friendly sliders. StartMe is translation ready, and has cross browser compatibility together with revolution slider. Parallax sections and videos can also be added. If you want to leave a mark through your App, Azul WordPress theme can make it come true. This theme is based on most powerful design principles that guide the user’s eye to the the right place in the page. 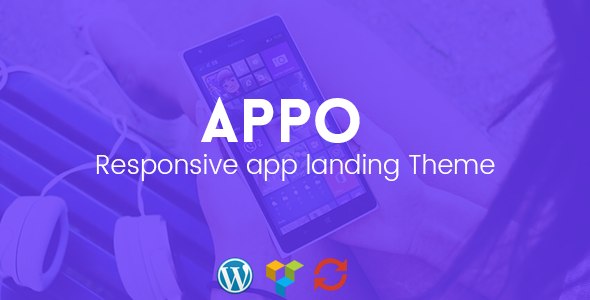 High responsiveness and customization options, Bootstrap Framework 3, parallax effects, cross browser compatibility are the typical features you find when using AzulApp. 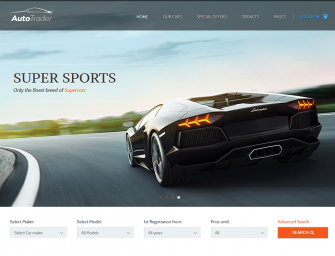 Best choice for creating a landing page as fast as the beeping road runner. You can’t fight the moonlight – that is to say, this theme cannot be rejected when you are searching for a good App-presenting page. With its clean and fascinating design, MOON is the perfect mobile app showcase for iPhone, Android and windows. One can just list the features of this One Page Template from its fully responsive design, Bootstrap framework, JQuery and CSS3 Animation, through Google Fonts, Unlimited Font & Icons, Image Background, Youtube Background, Cross Browser Compatible, to Working Contact Form and well commented code. If Batman had an App, this theme would be chosen for that. 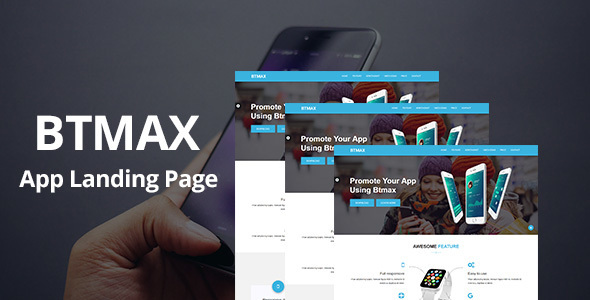 BTMAX is a stylish and very useful landing page theme with full of the regular features (Clean and Professional Design, Cross Browser Compatible, Fully Responsive, SEO Friendly Markup, Clean Code, Valid HTML5 & CSS3, Working Contact Form, Deep documentation, 24/7 Support). It is perfectly meeting your expectations on iphone and android.